Originally published in the August 9, 1994 issue of Country Weekly magazine. 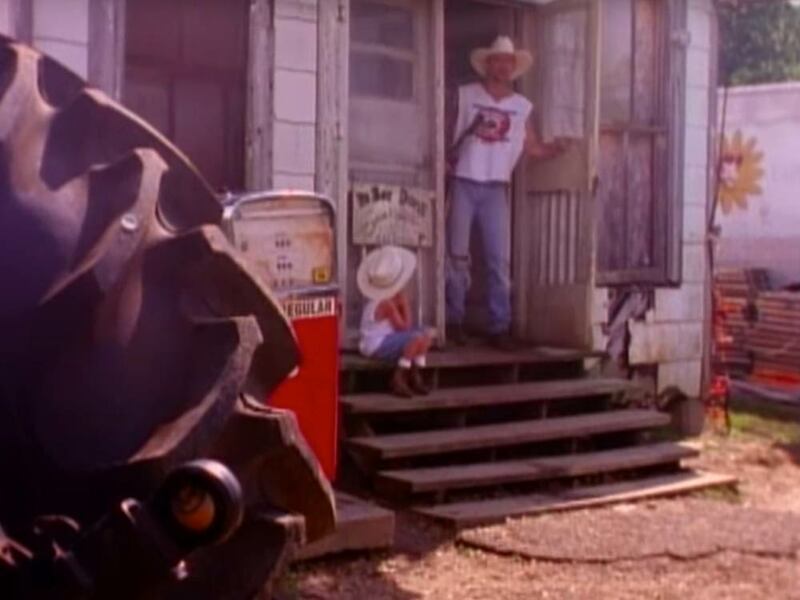 When Tim McGraw was selecting the site to film the video for “Down on the Farm,” the follow-up to his tear-jerking hit, “Don’t Take the Girl,” he chose the most logical place in the world — Tallulah, La., where he was raised. To illustrate this song that according to Tim “is about just hanging out with friends during the summer,” he filmed daily life deep in the heart of Louisiana, where hanging out with friends has been raised to an art form. The video captures many bayou characters, from former Ladies National Waterskiing Champion Jill Norman, an old friend of Tim’s, to the old-timers in the local five-and-dime, Po’ Boy Don’s, who pick and sing along with the country heartthrob. “These are real places that I hung out at while growing up,” Tim told COUNTRY WEEKLY, describing the locations where the video was shot. “For instance, we filmed at a roadhouse called the Siesta. I’d been going there since I was 16 years old,” he said. In spite of having two Top 10 songs off a No. 1 album and being featured on tour with Wynonna, Tim is as “down on the farm” as a person can get, and he wanted to include as many friends as possible. A very special friend in the video is Tim’s girlfriend’s little boy Tyler. You’ll spot Tyler, a cute blond-headed cowpoke in a white straw hat, in the scenes outside of Po’ Boy Don’s and the concert at the end of the video. So those moments when he is with Christine and her son, Tyler, are precious. On Tyler’s last birthday, Tim presented him with a sweet, chocolate-colored Labrador retriever, named Whitley, after the late singer Keith. “The dog is Tyler’s, but I named him,” Tim explained. A central scene in the video involves students from Northeast Louisiana University, where Tim went to college, off and on, for nearly three and a half years. The video features many of Tim’s fraternity brothers, as well as his fraternity’s 1928 Seagrave fire engine. “We had active brothers in the shoot and many alums from as far away as Texas, Oklahoma, and Mississippi, drove in for the video,” said Tommy Wallpole, a member of Pi Kappa Alpha fraternity at Northeast Louisiana. The homecoming must have felt very satisfying for Tim, who in spite of several years in school, wasn’t exactly Joe College. “I really wish I could finish, but it doesn’t look like that will ever happen,” he said. Considering that he’s the hottest thing in country music, Tim probably shouldn’t give it too much worry. The video has several subplots that all come together when Tim uses a jackknifed car-carrier for a concert stage. “We ended up with about 10,000 people there for the shoot,” Tim said. That number comes to about a kajillion times more than the population of the nearby town Tim spent his childhood in. “I grew up in Start, Louisiana,” Tim said. “It’s a very small farming town.” How small is it? “It’s got a cotton gin, a couple of convenience stores and a church and a school. Kindergarten through eighth grade was 800 people. They have a caution light. “It felt great to have 10,000 people show up, not to mention several gators nearby in the swamps. It was really cool,” he said. Actually, it was very hot. The temperature in Tallulah was near 100 degrees, and when combined with the oppressive humidity the all-day shoot resulted in several people passing out from heat exhaustion.